If your huppah has valances, that is, fabric pieces hanging at the sides, draping garland from pole to pole in front of the valances creates an interesting visual interplay of color and texture. 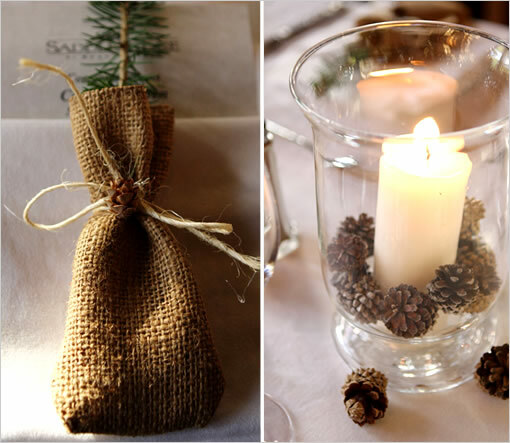 This is another huppah decorating option that works especially well for outdoor weddings. Your last option in decorating your huppah is to not decorate it at all, but to leave it unadorned and keep the emphasis on the people standing beneath the huppah and the ceremony. 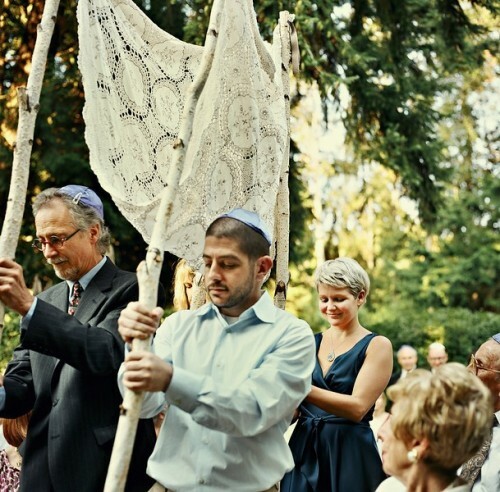 How tall should the huppah (chuppah) poles be? 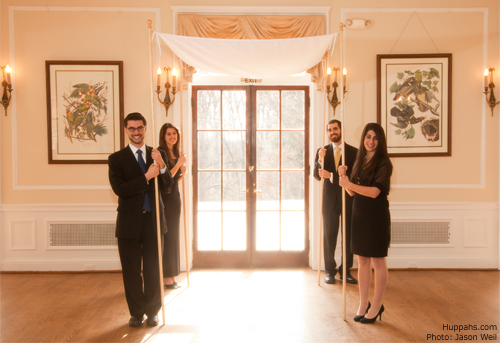 What size huppah (chuppah) poles should you use? 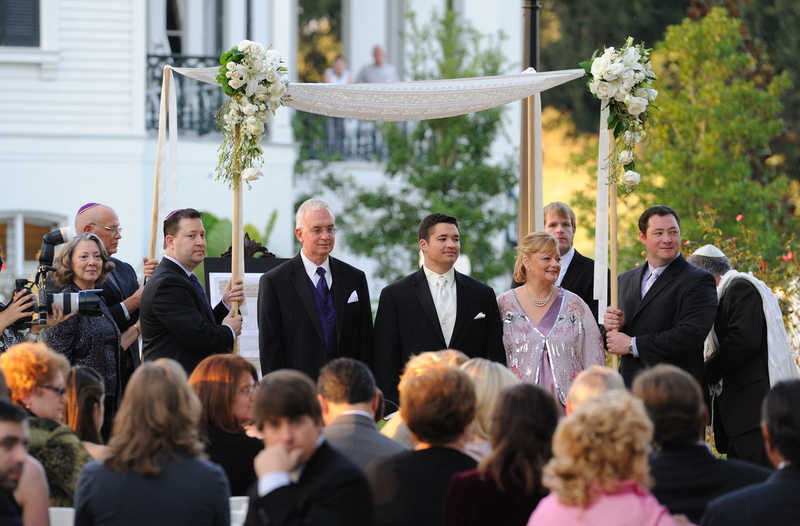 In most cases, the best height for huppah poles is 8 feet. That gives you lots of space under the canopy, and this size works for most conventional hotels and wedding venues and for ceremonies held outside. The poles in the photo at left are 8 feet tall. However, some small spaces require 7-foot poles, such as many inns, private homes, and cruise ship spaces. Huppahs.com has rented huppah poles for ceremonies in all of these types of venues. Your contact at the venue or your wedding planner will be able to tell you the height of the ceiling in your ceremony space. Outdoor wedding plans? Weatherproof your huppah. This morning I woke up to the sound of thunder and heavy rain on my window. By this afternoon, the weather was sunny and warm, but we’re expecting to wake up to heavy rain again tomorrow. The changing weather reminded me of a wedding where I delivered a huppah last summer. It was a sunny day with occasional fast-moving clouds, some of which dumped rain. 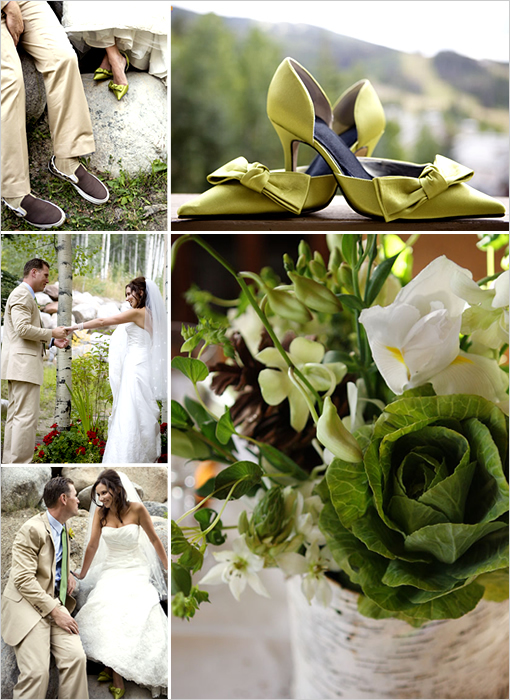 The venue was a beautiful inn with gorgeous lawns nestled in the mountains of Virginia. The bride wanted the outdoor wedding of her dreams, but the wedding coordinator, worried about the rain, was pressing the bride to have the ceremony indoors and let the facilities folks start setting up chairs. 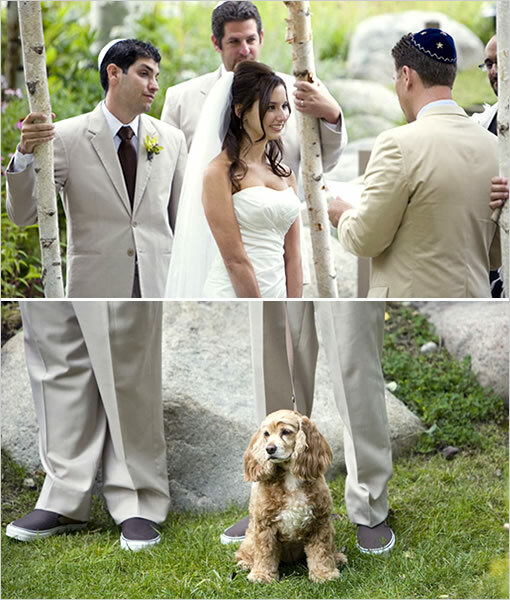 The bride insisted that they wait as long as possible before deciding that the wedding had to be moved indoors. 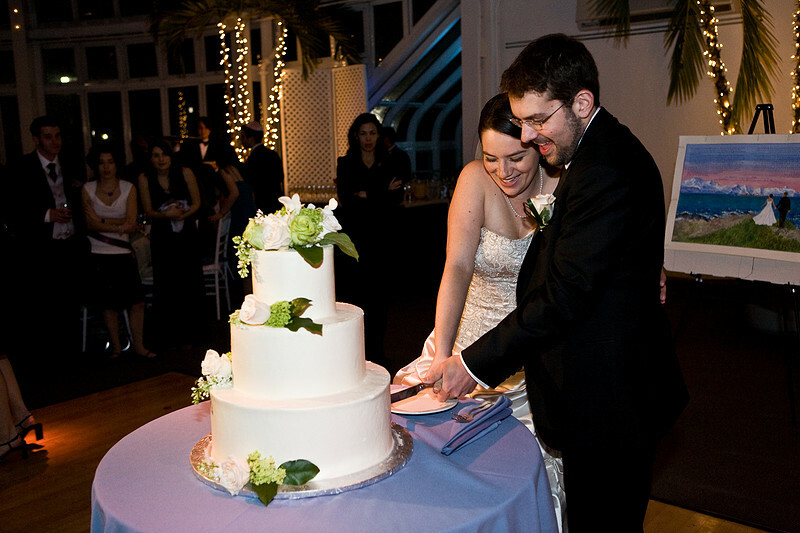 We knew that the hand-held huppah could be used as easily for an indoor ceremony as an outdoor ceremony. The coordinator knew how long it would take to set up the chairs. 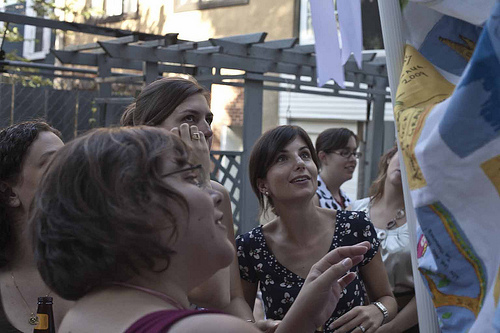 At zero hour, the sun was shining, and the bride chose to have the wedding outside. The coordinator signaled the facilities manager, and the chairs were arranged within minutes. The last chair was put in place just as the first guest, the bride’s grandmother, arrived. I watched from inside. The ceremony was beautiful. As the groom kissed the bride, a gust of wind lifted the huppah canopy, and a light sun shower began to fall. Perfect. I love a job where I get to cry happy tears on a regular basis. The bride got the outdoor wedding she wanted, but only because we knew that the hand-held huppah could be used indoors or outdoors with equal ease (and I knew that my canopy fabrics are chosen in part to hold up well in case they get caught in the rain). A stationary huppah would have to have been set up well in advance of the ceremony, and inside because of the uncertainty about the rain. A stationary huppah probably could not have been moved inside at the last minute. In the case of unexpected rain, a stationary huppah might not be able to be moved indoors at all. 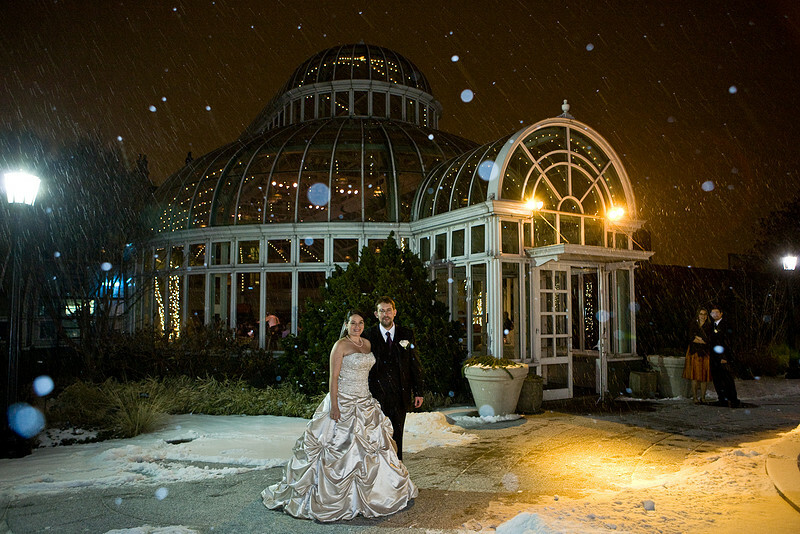 If you are planning an outdoor wedding, you and your coordinator will almost certainly be making back-up plans in case of bad weather. Using a hand-held huppah is the easiest way to weatherproof your huppah. The beautiful room in which we took the photos you see now at Huppahs.com is at Woodend Nature Sanctuary, owned by the Audubon Naturalist Society, in Chevy Chase, Maryland, just a few miles from Washington, DC. 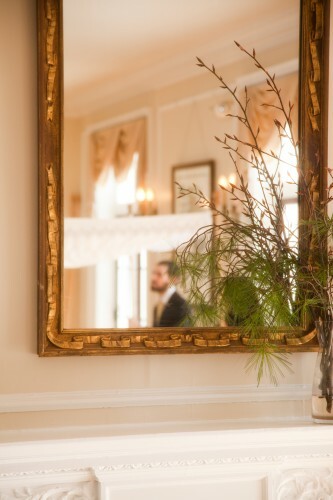 Woodend is consistently recognized by The Knot, Brides, and Washingtonian Magazine as a top wedding venue. 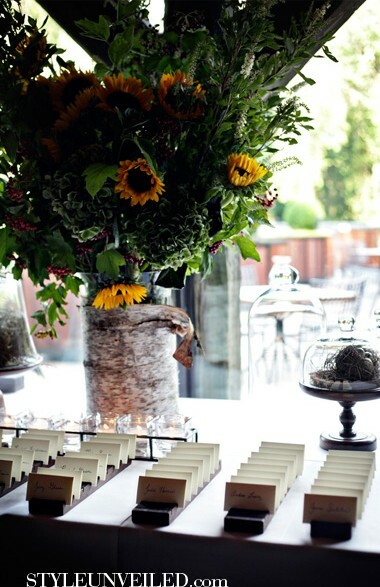 The sanctuary has gorgeous indoor and outdoor event spaces that accommodate up to 150 people. Audubon Naturalist Society is the oldest and largest independent nonprofit environmental organization in the Washington, D.C. area. 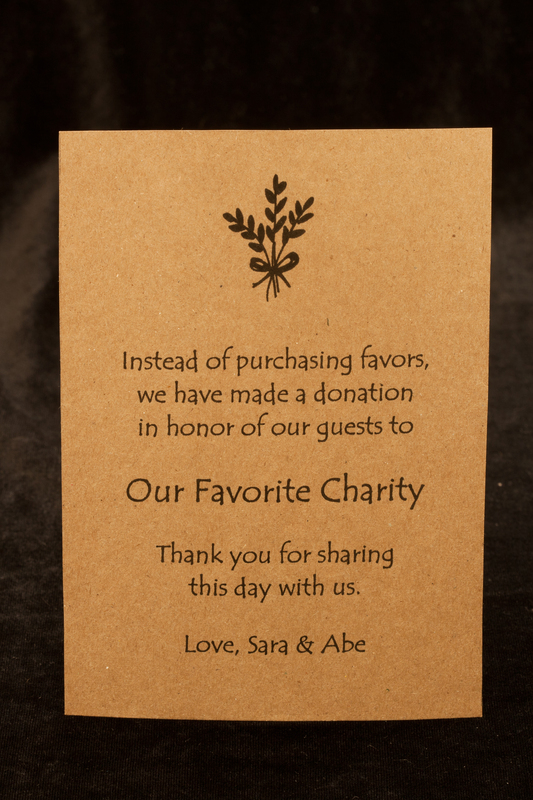 When you hold your event at Woodend, you not only enjoy a beautiful setting, you also support the organization’s environmental education programs and their efforts to preserve open space and work for clean air and water. 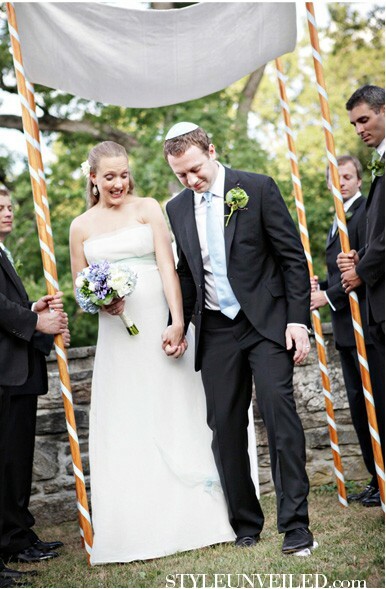 Ribbons are an easy and inexpensive way to add color and movement to your huppah. They should be long enough to catch the breeze. 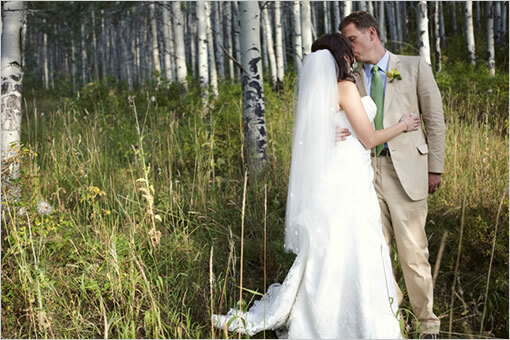 Huppahs.com, the leading national huppah rental company, now offers ribbons in this year’s most popular wedding colors. Spring Brings New Huppahs to Huppahs.com! Why do the Jewish bride and groom wear white? 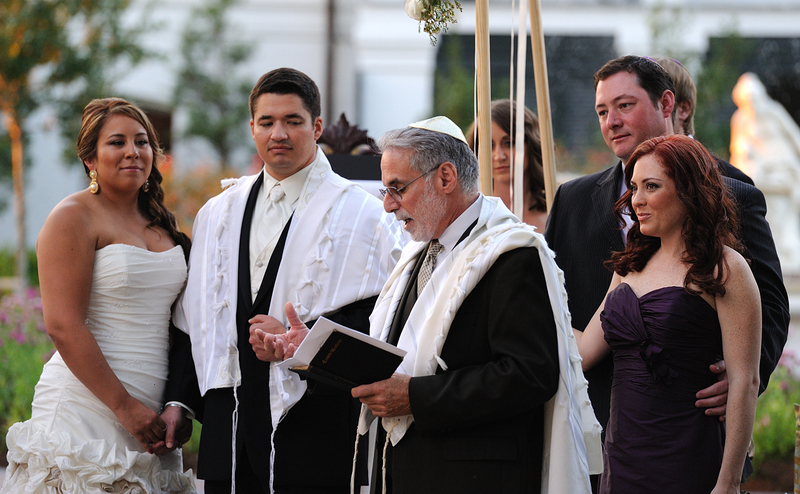 In Judaism, a person’ wedding day is a day of renewal, a personal Yom Kippur. On the wedding day, the bride and groom’s souls are wiped clean. White is a symbol of the bride and groom’s spiritual purity. The bride wears a white wedding dress, and the groom traditionally wears a white robe called a kittel, or a tallit, a prayer shawl. 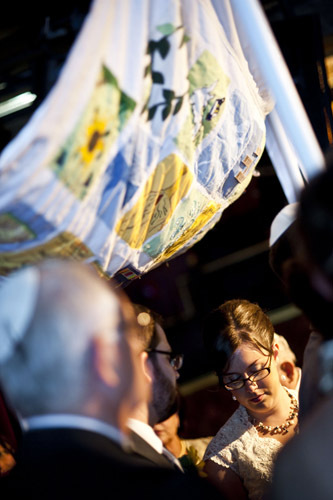 How old is the practice of using a huppah for Jewish weddings? 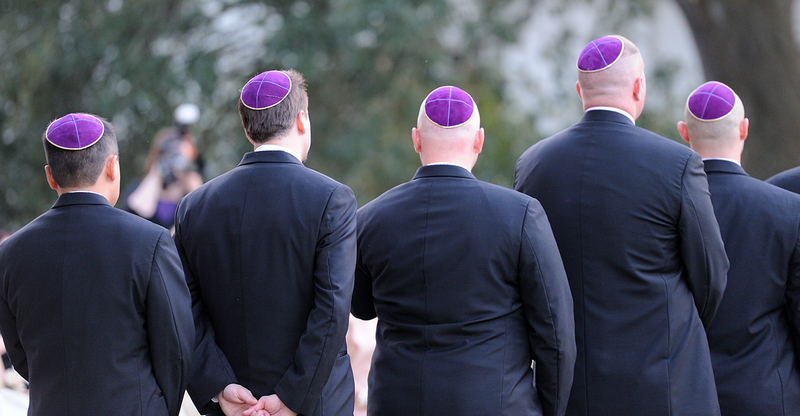 Huppahs (also spelled huppas, chuppahs, or khupas) became a part of the Jewish wedding ceremony during the Middle Ages in Europe, about the same time and place that men began covering their heads with kippot (yarmulkes). 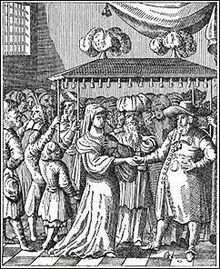 The Middle Ages sounds like a long time ago, but when you consider that Judaism’s history reaches back 5,000 years, the wedding huppah is a relatively young custom. The earliest huppah poles were only a few feet tall. Four young men would hold the poles as they escorted the bride, who walked under the huppah, from her home to the synagogue. 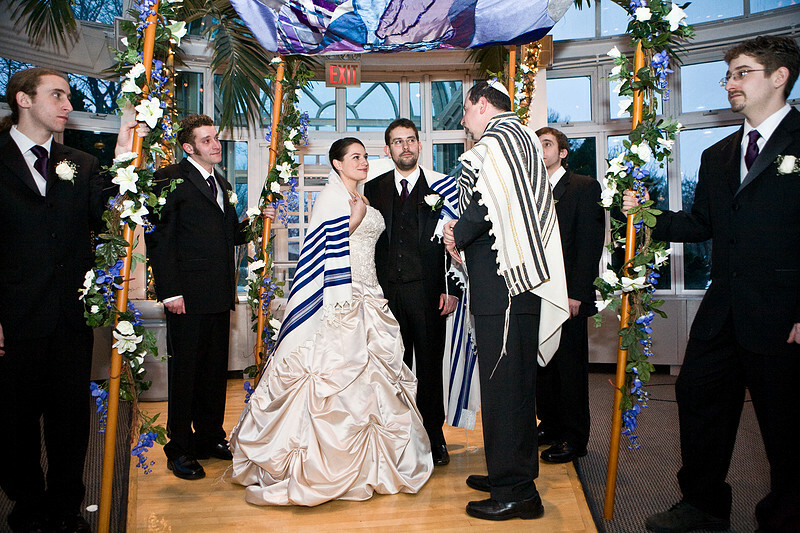 Why does a Jewish wedding ceremony take place under a huppah? The huppah serves as a visible representation of the home, both physical and spiritual, that the bride and groom will share as a married couple. Traditionally, the bride creates their shared spiritual space as she steps under the huppah and circles the groom. 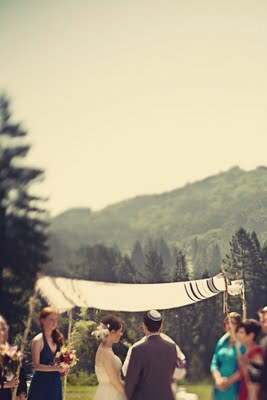 Tagged as chuppah, chuppahs, circling the groom, huppa, huppah, huppahs, Jewish bride, Jewish groom, Jewish home, Jewish spirituality, Jewish wedding ceremony, Jewish wedding customs, Jewish wedding traditions, Jewish weddings, khupas, weddings, Why does a Jewish wedding ceremony take place under a huppah? What Makes a Huppah a Huppah? The huppah’s structure evokes a tent — specifically, the tent that was the home of Judaism’s first couple, Abraham and Sarah, 5,000 years ago. 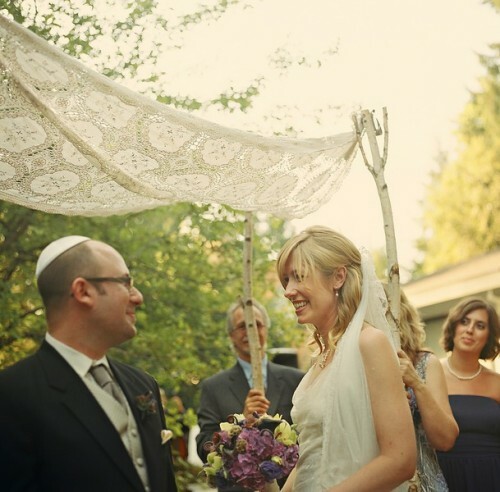 A huppah (also written chuppah or huppa) has a fabric canopy held aloft by four poles or a frame with four legs. The huppah is open on all four sides, as the tent of Sarah and Abraham is said to have been because of their great hospitality. I had to show you these photos of a very pretty evening wedding, from Surrendering to Serendipity, Gayle Harper’s blog about her travels along the Mississippi Great River Road. Serendipity indeed. 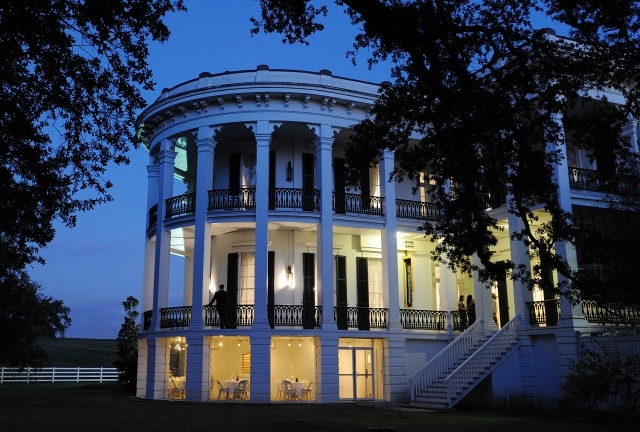 While staying at the 150-year-old Nottoway Plantation she found preparations underway for this wedding and captured it on film. As dusk fell, the reception began. Natural poles with soft ribbon stripes. Cari and Dan’s wedding at Blue Hill Farm in New York shows how details from nature can create a sophisticated style. Their unifying approach: Set natural elements against a backdrop of stripes. Strive for high quality in the natural elements. Keep the stripes soft, not bold. White ribbon wrapped around the wooden huppah poles. 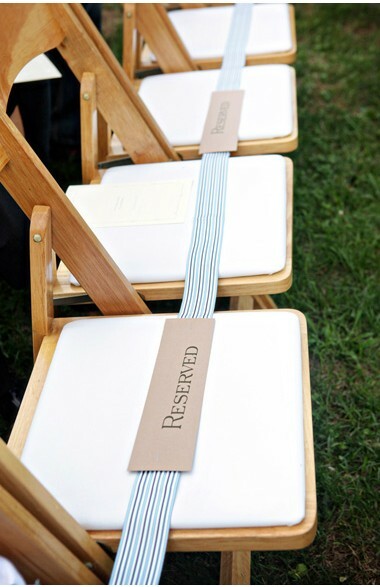 Striped ribbon of natural fibers laid across wooden chairs. 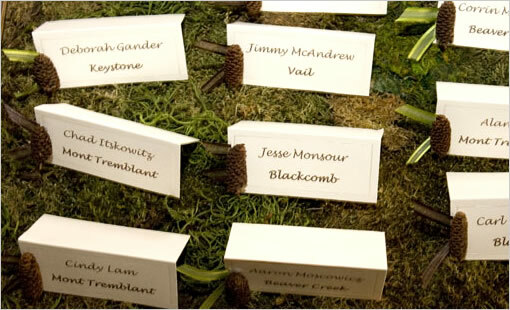 Informal table bouquet contrasts with the straight lines of the place cards. Inlaid stripes on the hors d’oevres trays. 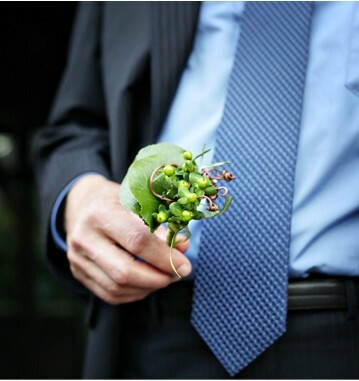 The groom’s boutonniere, a masculine arrangement of natural elements, finds contrast in the tie’s softly suggested stripes. "...We circled each other. 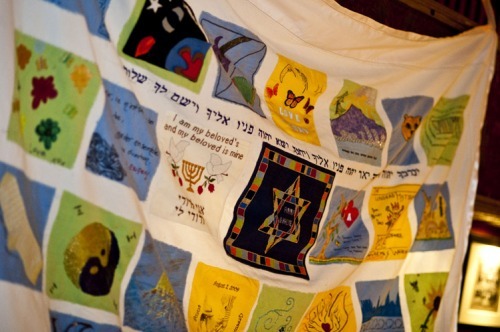 We did, in fact, feel our lives intertwining..."
A.’s huppah, crafted by her Mom from huppah squares made by family and friends, became a way for her non-Jewish family members and friends to feel intimately connected with her wedding ceremony. 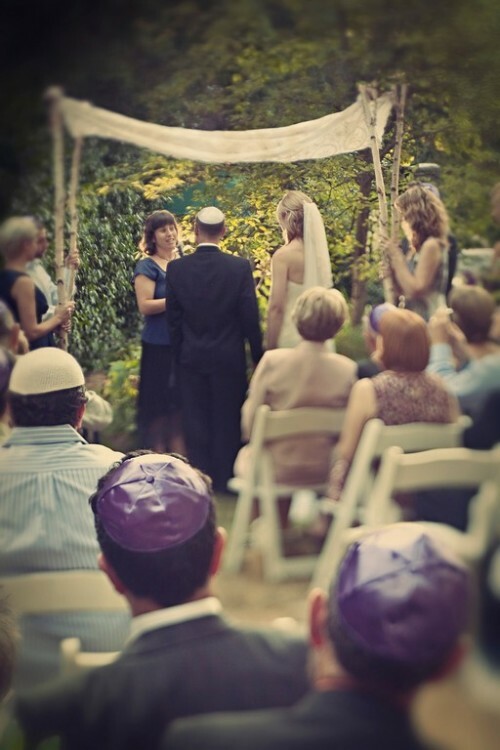 Standing underneath the huppah, it felt to her like a shower of blessings and love. Wedding photo taken by Davina + Daniel of New York and Montreal. You can find more beautiful photographs from this wedding, with inspirations and ideas for outdoor weddings, at Elizabeth Anne Designs. The photographer behind these breathtaking images is Heather Gilson. She and her photographer husband, Jon, are based in Seattle and Hawaii.